Whether you train with us in-home or at Results, The Gym, friendliness and professionalism elevate the Effervescence training experience to a higher level of sophistication. Our goal is to help you achieve your short and long term fitness and health goals. A personal trainer is no longer a luxury; it's a great investment in your overall health and wellbeing! Ask any fitness expert and the answer is always the same. The best way to get started and improve an existing exercise program is to use a personal trainer. Certified trainers work intimately and intensively with clients to design the exercise program best suited to that client's needs and goals - then supervises every workout to assure maximum effectiveness and efficiency. Workouts are fun and safe, leaving you feeling exhilarated and stronger. New exercisers get a fitness program tailored to their precise needs and desires, assuring progress without injury. You'll learn the safest and most effective way to perform each movement. Exercisers with medical conditions get a program coordinated with their doctor or physical therapist. Our trainers are experienced in dealing with a wide range of physical challenges. Need help sticking to a program? Trainers make workouts fun. They make the best of all workout partners. Schedule your workout time and remove the excuses to skip a workout. They motivate, encourage, and keep routines fresh. 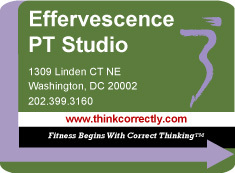 If you are looking for more than just another gym to train your clients, then the Effervescence Personal Training Studio may be just the place for you. Enter an environment that allows you to get more from the one-on-one training experience. Control your own rates, get a more substantial piece of that training rate. Maintain the high quality service offerings you have prided yourself in offering. Allow us to help you develop a flourishing personal training business. For more information contact Elizabeth at 202.398.1909.